The creative juices are oozing, and my keyboard is clackin’ away at ghosts, witches, psychotic innkeepers, and IRS forms. There’s plenty else to do at home and at work, but I’m on a roll. The thirteenth anniversary edition and rewrite of The Bell Witch: The Full Account is progressing; I’ve already reduced the page count by nearly fifty percent! Yes. Say lots more, but with fewer words (Writing-101). From Turkey Creek – A Memoir is wrapped up. Now, on to packaging, pagination, and formatting. I’m also working, albeit passively, on the sequel to Ghostly Cries From Dixie. Oh, and speaking of Ghostly Cries (the current version), I inadvertently let the “Dead of Winter” special ($2.99 eBook) expire without telling anyone. Geez, maybe I am the “big, bad wolf” that some folks make me out to be. To be fair, I’ll continue the special until May 15th. The foreword to “The Legend of Stuckey’s Bridge,” by Lori Crane, is bleeping on my radar and is bleeping awesome! I’m so excited about the project and am honored to have the privilege of working with Lori. Look for the book this fall! And speaking of autumn, requests for book signings and lecture appearances this fall are trickling in; this could get interesting. Those events don’t include the release festivities planned around October 13th’s “Bell Witch” release, which will have me on the road in several states come mid-October. That’s all for now. I need to grab more coffee, get more comfy, and write more words. 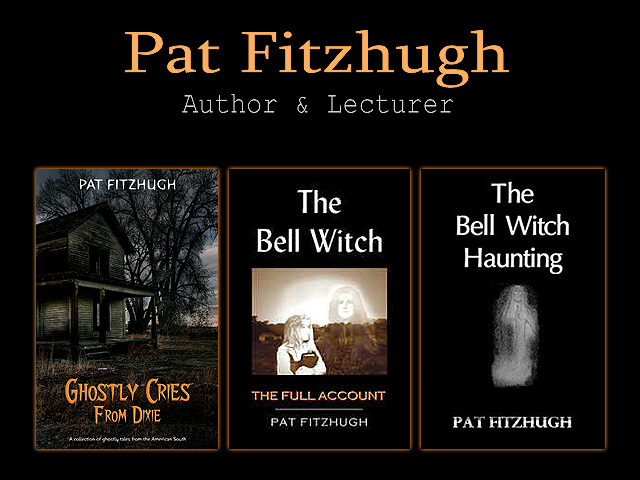 Posted in authors, Books, e-books, Ghosts, Historical Fiction, Paranormal and tagged amwriting, books, e-books, editing, ghosts, haunted, hauntings, paranormal, wip on April 16, 2013 by Pat Fitzhugh.